We will be publishing the full index in October, but, we are revealing the CDI’s migration rankings now, so they may offer a backdrop for the discussions in New York. Read on to find out how countries measure up. Migration policies are one of the most important, and underused, tools to reduce poverty and promote development. In the words of our colleague Michael Clemens, we are leaving trillions of dollars on the sidewalk (or pavement). As Clemens has convincingly argued, migration leads to a development gain, not a brain drain. Increased opportunities for well-managed migration bring massive increases in incomes and well-being for individuals, their families and their countries, through higher earnings potential, remittances, trade, and the increased circulation of ideas and knowledge. To arrive at the index for each country, we look at three broad aspects of rich countries’ migration policies. First, their willingness to accept migrants from the developing world; second, how well those migrants are integrated; and third, whether the country participates in a raft of international conventions on migration. Based on those broad criteria, New Zealand, Norway and Australia have the most development-friendly migration policies; while the Visegrad four - Czech Republic, Hungary, Poland and Slovakia, languish at the bottom of our table of 27 rich countries. Of the G7 major economies, Canada ranks highest for its migration policies, at 4th place, with Germany 6th and Italy at number 12. The US, Japan, UK and France all lie in the bottom half of the table. First we score countries on the number of people they accept: migrants and students from developing countries; and refugees and asylum seekers; and we look at these broadly in proportion to their population. Australia and New Zealand have the largest inflow of immigrants relative to their populations, while, if you’ve been following news reports of the reaction to (mainly) Syrian refugees arriving in Eastern and Central Europe, you perhaps won’t be surprised to learn that the least open are the Visegrad countries – Czech Republic, Hungary, Poland and Slovakia. 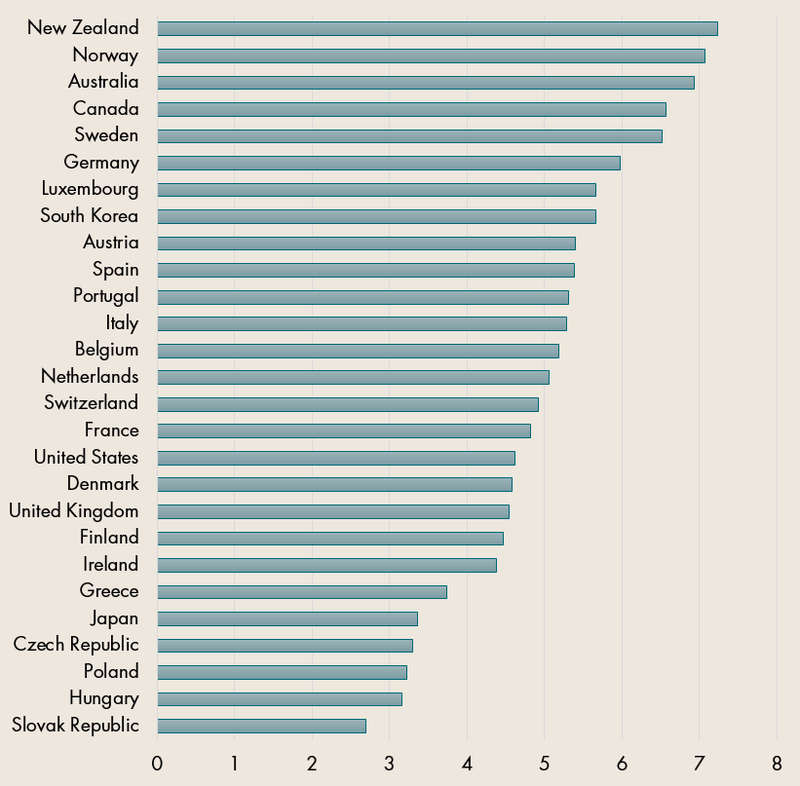 New Zealand and Australia are also the most welcoming toward students from developing countries. On this measure, the Czech and Slovak Republics again find themselves at the bottom, where they are joined by Denmark and The Netherlands. (To be fair, the relatively low numbers of people wanting to study in these countries may have something to do with the perceived difficulty of the language, as well as how welcoming they are to students.) Though the Netherlands does badly on students, it can boast of rivalling Sweden for being most open to refugees and asylum seekers. Portugal, Slovakia and South Korea accept the fewest refugees, and Japan and Poland accept the least asylum seekers. The benefits to migrants, and their families and countries of origin, depend not only on numbers but on how those people are treated and the opportunities that are available to them in their new home. We use data from the Migrant Integration Policy Index (MIPEX), a tool which comprehensively assesses whether countries have good policies to support the integration of migrants. MIPEX takes into account 167 policy indicators, which grouped into 8 categories: education, health, political participation, family reunion, anti-discrimination, access to nationality, and permanent residence. Among the CDI countries, Portugal and Sweden top the list for integrating migrants, followed by Finland, Belgium, and Canada. Finally, we look at the extent to which countries participate in international conventions on migration. We understand, of course, that international conferences often have only a distant connection to people’s real lives; but we also know that over time, international conventions help to establish standards, norms and principles which help shape the behaviour of the international community and individual countries. We argue that there are therefore long-run benefits from countries being willing to agree to these standards, even if they are not always able to live up to their commitments in full immediately. The migration component therefore gives countries credit for ratifying three international agreements: the 1949 Migration for Employment Convention, the 1975 Migrant Workers Convention, and the Protocol to Prevent, Suppress and Punish Trafficking in Persons. Only three countries – Italy, Norway, Portugal – are party to all three conventions, while Japan and South Korea have ratified none of them. Migration policies reflect the economic, social and political circumstances of each country, and it is foolish to claim that any country could simply adopt the policies being pursued elsewhere. Nonetheless, looking at the fine detail of countries’ policies can help us understand where there might be room for improvement, and help us to identify inspiring examples of countries that do this well. And the CDI migration scores are on element of the annual Commitment to Development Index, along with hundreds of other indicators across six other policy areas: aid, trade, finance, security, climate and technology. This short video helps explain. The full CDI results for 2016 will be released in a few weeks.